According to a new report published by Acumen Research and Consulting titled “Synthetic Zeolite Market (Application: Detergents, Adsorbents, Catalysts, Others; Geography: North America, Europe, Asia-Pacific, Rest of the World) – Global Industry Analysis, Market Size, Opportunities and Forecast, 2013-2020”, the global market for synthetic zeolites is projected to grow and reach over $1.5 billion by 2020 at a significant rate of more than 4% from 2014 to 2020. 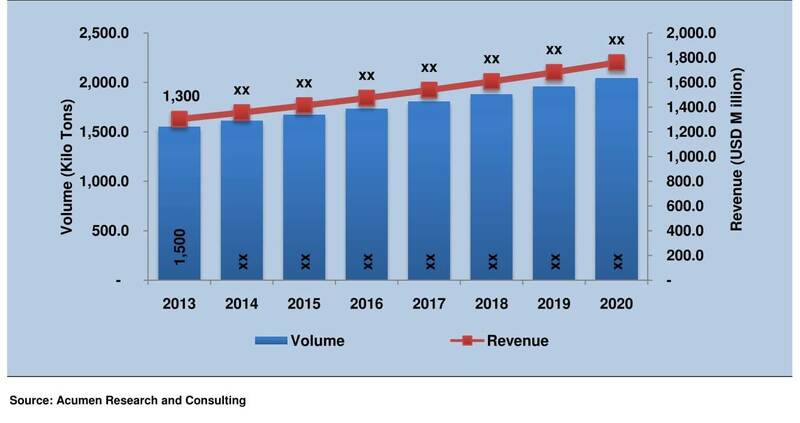 Based on volume consumption, the market is projected to reach over 2 kilo tons by 2020, growing at a CAGR of around 4% during the forecast period. Based on applications, the synthetic zeolite market is segmented into detergents, adsorbents, catalysts, and others. Governmental regulations that limit the usage of phosphates in detergents due to environmental concerns is the key driver for the synthetic zeolite market. Usage of synthetic zeolite as molecular sieves for adsorption and petrochemical catalysts are the other major applications that account for a significant market share. Adsorbent application is expected to expand at the fastest rate globally owing to high demand in several end-use industries including automotive and petrochemical processing. The price of synthetic zeolites varies according to its application. Detergent grade zeolites are the cheapest, while zeolites used as catalysts and molecular sieve adsorbents are priced considerably higher. Asia-Pacific accounts for the highest demand for zeolite, followed by Europe and North America. Demand for zeolite is expected to increase at the fastest pace in Asia-Pacific in the near future. Further, synthetic zeolites are extensively used as catalysts for the FCC process in petrochemical refineries, especially in North America. However, usage of zeolitic molecular sieves as adsorbents is estimated to be the fastest growing application segment due to its application in numerous end-use industries including petrochemical, manufacturing and automotive. The global synthetic zeolite market was dominated by Asia-Pacific, which accounted for more than 40% of the global demand in 2013. The region’s market share is anticipated to increase at a rapid pace in the next few years. Among the major players operating in this market, few profiled in the report include Zeolyst International Inc., Albemarle Corporation, Fujian Risheng Chemical Co. Ltd., W.R. Grace & Company, Anten Chemical Co. Ltd., BASF SE, Chemiewerk Bad Kostritz GmbH, Clariant AG, Honeywell International Inc., and Huiying Chemical Industry Co. Ltd. among others.